Knight and Day (2010) is one of the most polarizing movies I've ever seen. I don't mean that some people I talked to loved it and some people hated it, I mean I literally am on both polar opposite ends of the spectrum of enjoyment with this movie. On the one hand, this was one of the funniest action/comedies I've seen in a very long time. This movie is up there with True Lies for me in terms of the excellent combination of the two genres. Tom Cruise's character and dialogue are both hilarious and perfect in almost every way. There's that great scene on the airplane where Cameron Diaz is in the bathroom psyching herself up to flirt with Cruise while he's beating up secret agents without her knowledge. Comedy is different for everyone because of differences in taste and all that, but for me this was the highlight of 2010 in terms of comedy (I also don't watch many comedies, so that might be a factor). But then there's Cameron Diaz's character. Diaz plays the epitome of the woman who cannot survive in the real world without the strength of a man. Once she joins Cruise she finds herself continually in situations she has neither the mental nor physical fortitude to overcome. There's this one scene where she fires an uzi and the recoil make her lose control and almost kill Cruise. And that's not even the only time Diaz almost ends the movie early by killing its actual (male) protagonist. She ruins his plans so consistently that more than once Cruise has to knock her unconscious in order to achieve his goals. This is the kind of movie that makes stuff like Salt and Haywire look like feminist manifestos. Knight and Day is so sexist that I find it nearly impossible to harden my nerves enough that I can enjoy it without cringing. Which is really a shame, because it is a rather funny film if you can overlook its shortcomings. - "With me, it's here. Without me, here. With me, without me. With me, without me." - "Hey June. That's a beautiful dress by the way." - "What am I wearing?" - Seriously though, this was a really funny movie. Why'd you have a write a stupid character for Cameron Diaz? I don't harbour many good thoughts towards this movie. I just didn't think it was rich comedy in any sense, and I wonder why it was made, what attracted the director and the stars to this vehicle. The most obvious fault with the film is the title. The title is baffling. 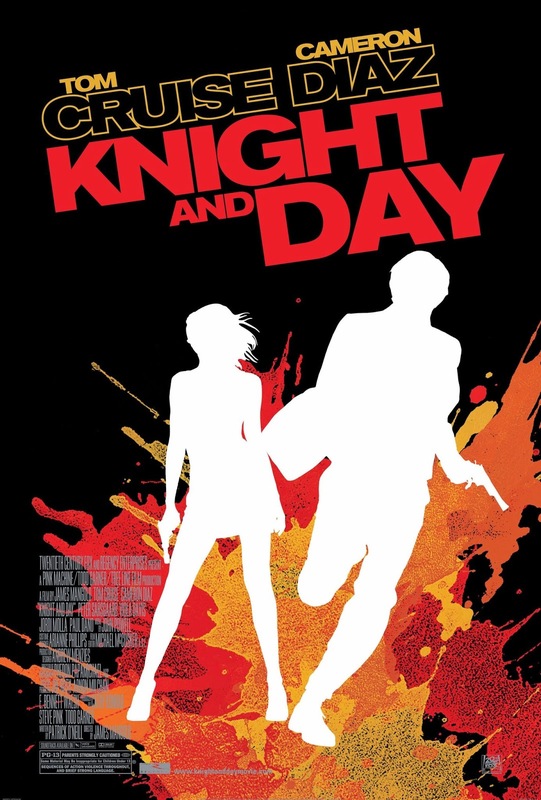 Apart from the letterbox shot at the end, there's no reason to call the movie 'Knight and Day'. No reason whatsoever. That, I guess, is why the movie is garbage to me. The writer obviously thought up the title, wrote the movie later on while forgetting the title, then slipped in that letterbox shot at the end as an afterthought. Dumb writing. Maybe I just need to revisit it again on DVD. Who knows, maybe it's better upon second viewing. Thanks! I think comedy is difficult because differences in taste really make or break a movie. If you don't think the jokes are funny, the rest of the movie is going to fall flat. As to the title, I think you may be right. It seems like one of those bad pun situations where the writer thought it would be funny and then forget to integrate the joke into the movie. Anyway, thanks for the counterpoint perspective!